As smartphones get more affordable, while mobile and internet penetration on the continent continues to rise, we see the impact in multiple ways. Last year, hellofood the online delivery platform counted the same quantity of orders from mobile phones as from desktops: both accounted for 50% of the total with the amount expected to surpass desktop orders shortly. Some countries are already mobile-first, for example Tanzania, where 79% of customers order food on their phones. Egypt (56%) and Ivory Coast (54%) have also shifted to mostly mobile orders. 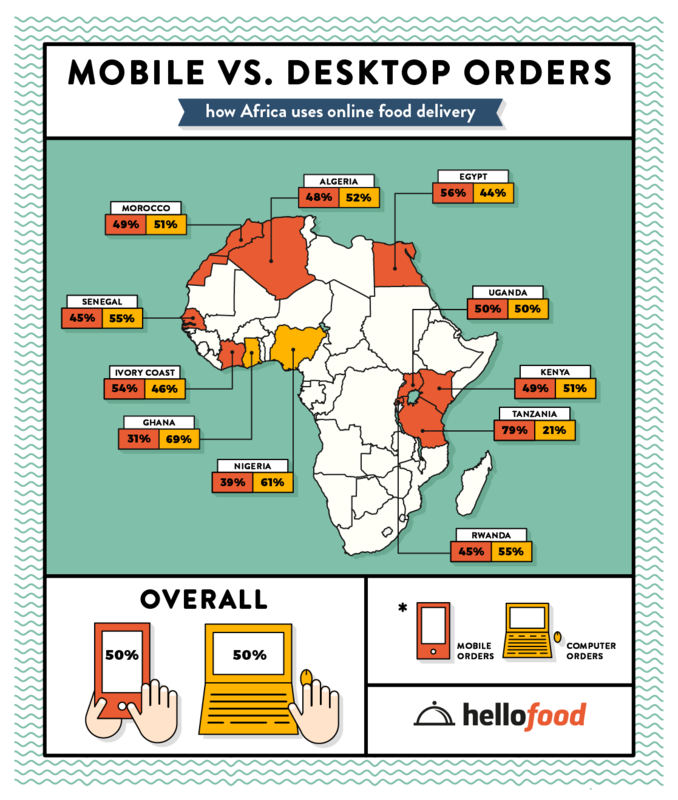 The other countries still make the majority of orders via desktop, with Ghana (69%) and Nigeria (61%) having the highest numbers of desktop orders. According to hellofood, Studies have shown that most Africans use their mobile phones predominantly to listen to music and interact with friends and relatives on social media. Taking pictures and browsing the web for information were also listed among the most common activities. But when it comes to mobile banking and payment, most users still seem slightly wary. This explains why they adapted cash on delivery rather than VISA or any other online payment systems. With MTN as a partner, there’s a push towards using Mobile money that is probably working. do you have the hellofood app? Between the desktop and mobile app which one do you use the most? share with us in the comments.